SCAMMER NAME: Mohamed Lucien & Co. Question: How do you get a scammer to burst into fits of rage? Answer: You get him to board a plane and travel a few hundred miles to meet you, except you don't turn up! A. Skinner is contacted by a 419 scammer posing as a doctor working on behalf of a desperate widow. As time goes by, the opportunity of causing some real scammer aggravation arises and Shiver Metimbers is called in to the proceedings! by the accedent of the Earth weak. and her daughter come over to me you and your family. the receipt of your quick response. Of course I would be willing to help in this situation. I am aware of the unfortunate circumcision in Indonesia. THANKS FOR RESPOND AND YOUR CONCERN ,OF BEEN TO HELP THE WIDOW TO BE HER BENEFICIARY SINCE HER FIRST BENEFICIARY HAS BEING KILLED AT INDONESIA BY THE EARTH WEACK INCIDENT A MONTH AGO. THE WIDOW CAME TO THE CLINIC TODAY AND SHE WAS VERY WORRIED ABOUT HER CONSIGNMENTS NOT TO BE RETURN TO AFRICA BECAUSE OF DELAY. BUT I EXPLAIN TO HER AND ADVICE HER THAT I HAVE HEARD FROM YOU, THAT YOU SAID YOU WILL MAKE ARRANGEMANT TO HELP HER TO MEET WITH THE DIPLOMAT AND CLEAR THE CONSIGNMENTS FROM THEM . AFTER I HAVE EXPLAIN SHE WAS VERY HAPPY AND SAID SHE WILL KEEP ASIDE FEAR PERCENTAGE FOR YOU AFTER YOU HAVE RECEIVED THEM TO YOU HOUSE AND YOU SHOULD SEEK FOR A LIVING HOUSE TO BUY WHEN SHE HAS ARRIVED TO YOU WITH HER DAUGHTER TO USA. BUT SHE SEE REASON WHY SHE ASK ME TO TELL YOU THAT YOU SHOULD TRY YOUR POSSIBLE BEST TO SEND YOUR FIRST PAGE OF YOUR INTERNATIONAL PASSPORT OR YOUR DRIVING LICIENCE FOR HER TO KNOW WHOM SHE IS DEALING WITH MORE BETTER. THIS 4 INFORMATIONS WILL ENABLE THE DEPLOMAT TO ABLE TO DELIVER THE CONSIGNMENT TO YOU AT YOUR DOOR STEP OR YOUR HOUSE. IMMEDIATELY YOU SEND THE INFORMATION , THE I CAN SEND IT TO THE DEPLOMAT BOARD IN TEXAS TO DELIVER THE CONSIGNMENTS TO YOU AT YOUR DOOR STEP AS I HAVE SAID . YOU SHOULD SEND THEM VERY FAST FOR THEM TO MEET WITH YOU, BECAUSE THE WIDOW WILL NOT BE HAPPY IF THE CONSIGNMENTS RETURN HERE IN AFRICA BECAUSE OF THE REASONS I TOLD YOU IN MY FIRST MAIL TO YOU. IF POSIBLE SEE BACK PAGE AGAIN. CALL ME AS SOON YOU RECEIVED THIS MAIL .I AM DR. MOHAMED LUCIEN THE SOLE PROPRIETOR OF THE ABOVE CLINIC .00233 244 937082. WHAT IS THE PROBLEM WITH YOUR PHONE???? YOU GAVE ME A NEW NUMBER TODAY AND I CALL YOU BUT SOME ONE TOLD METHAT IT IS A WRONG NUMBER WHY????????. YOU HAVE TO BESERIOUS WITH THIS REGARD AND COMPOSE YOUR SELF AND SEND THE ORIGINAL NUMBER SO THAT I CAN REACH YOU EVEN THE DEPLOMAT OK. BECAUSE I WILL BE VERY BITTER WITH YOU IF I SEE THAT THE DEPLOMAT RETURN THE CONSIGNMENT TO AFRICA FOR THE SAKE OF NO RECIPENT OR DELAY. PLEASE TELL ME NOW THAT YOU ARE NOT READY TO HELP THE WIDOW ,BECAUSE I CAN NOT UNDERSTAND YOU NO MORE. YOU LIE TO ME THAT YOU CALL MY HOT LINE NUMBER BUT IT WAS NOT GOING THROUGH . CALL THE NUMBER AGAIN 00233 244 937082 . I HAVE NO TIME TO CRAKE A JOKE WITH YOU NOW BECAUSE THERE IS NO TIME TO WASTE AFTER ALL THE DELAY. DO YOU SUGGEST THAT I SHOULD LOOK FOR ANOTHER BENEFICIARY WHO CAN HELP THE WIDOW????????? THERE IN USA. I DONT WANT THE WIDOW CONSIGNMENT TO GET LOST ,THAT WAS WHY I SEEK FOR YOUR ASSISTANT OK. IF YOU KNOW YOU CANT CALL ME THEN YOU ARE NOT READY TO HELP HER. CALL ME NOW SO THAT THE DEPLOMAT CAN UPDATE YOU . I AM DOING ALL THIS BECAUSE I GARANTEE THE WIDOW THAT I HAVE A RELIABLE FRIEND WHO CAN HELP HER THERE WHICH IS YOU. CALL ME AND GIVE YOUR NUMBER AGAIN WHICH IS THE CORRECT ONE. THERE IS NO TIME TO WASTE OR JOKE BECAUSE THE CONSIGNMENT IS ABOUT TO COME BACK TO AFRICA. I WAS IN RECEPIENT OF YOUR DATAS, AND BE ADVICE THAT I HAVE FORWARD YOUR INFORMATINS TO THE DEPLOMAT ,IN REGARD OF THE DELIVERY OF THE CONSIGNMENT TO YOU. AND WITH THIS DATA I HAVE FROM YOU I KNOW YOU CAN NEVER RUN AWAY WITH THIS MONEY. I HAVE BEING TRYING TO CALL YOU ALL DAY BY THE PHONE WAS IN ANSWERING MACHINE ,WHY ????. WHEN YOU KNOW THAT YOU HAVE A VERY IMPORTANT BUSINESS WITH ME. ALSO I ASKED YOU TO CALL ME ,BUT YOU FAILED WHY???? YOU HAVE TO PREPARE NOW BECAUSE THE DEPLOMAT WILL CALL YOU AND YOU HAVE TO ARRANGE ON HOW THINGS WILL GO VERY SMOOTHLY TO MAKE SURE YOU RECEIVED THE CONSIGNMENT, YOU HAVE TO KEEP THE SECRET TO THE DEPLOMAT BECAUSE THEY DO NOT KNOW THE CONTENT OF THE TRUNK BOX (CONSIGNMENT). AND YOU HAVE TO CALL ME ALSO TO UPDATE ME THAT YOU HAVE OPEN YOU PHONE SO THAT I CAN STILL TALK WITH YOU . I HAVE SHOWN YOUR PICTURE TO THE WIDOW THIS MORNING WHEN SHE CAME FROM THE REFUGEE CAMP FOR TREATMENT, AND SHE WAS VERY HAPPY TO SEE YOU FOR THE FIRST TIME. TRY AND OPEN YOUR PHONE AND MEET WITH THE DEPLOMAT NOW BECAUSE I WILL NOT BE HAPPY IF THE CONSIGNMENT SHOULD BE RETURN BACK TO AFRICA. Try me at the other number which is 254-741-XXXX. I cant get thru on your number. Or, say the pass phrase which is my church name of the church of the Holy Mackerel. Mohamed is given a bad telephone number! You are a disgrace speaking to me that way. I accidentally gave you the wrong number. The correct one is 254-741-XXXX. PLEASE FORGIVE ME AND LETS BE ONE AS BEFORE , HELP THE WIDOW AS YOU HAVE PROMISE EARLIER, SHE IS EVEN ARRANGING ON HOW SHE WILL COME OVER VERY SOON YOU CLEAR THE CONSIGNMENT TO YOU HOUSE. PLEASE KEEP THE SECRET TO THE DEPLOMAT THAT THE CONTENT IS NOT MONEY. SO THAT THEY MAKE NOT RAISE EYE BROWN ON YOU OK. I should be in most of the day. Please call. 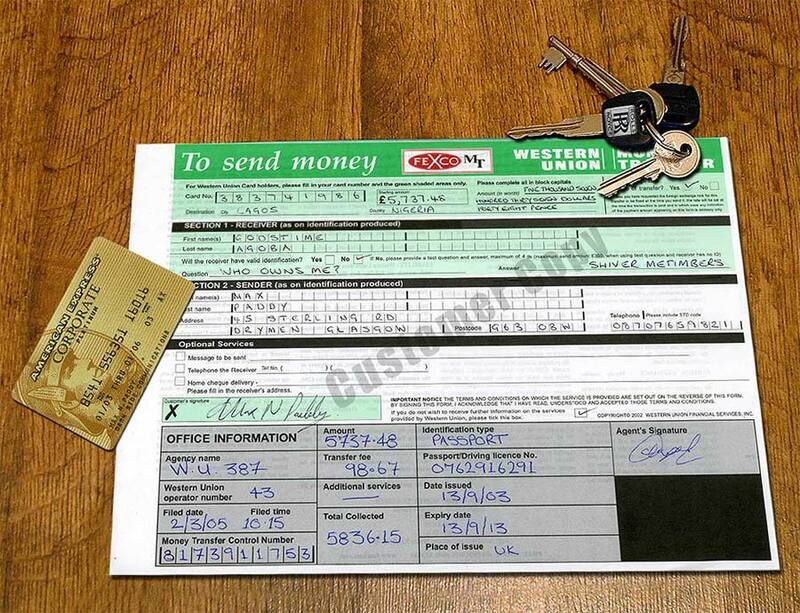 Mohamed's scamming partner, Peter Corey quickly gets in touch with instructions on paying the "fee". As soon as the money is collected i'll proceed to get your consignment cleared and come to you for the delivery.Please,let me know the nearest airport to you so that i'll route my ticket there. You can give me a call on my phone number: 1-713-478-9116 as soon as you receive this mail. Mohamed checks to see if the payment has been sent yet. Subject: HAS THE MONEY BEEN SENT??? HAVE YOU HEARED FROM THE DEPLOMAT ? PLEASE KEEP ME UPDATED . I have talked to Peter Corey. He wants me to send money to him and 2 others named Mr. Scott Lake and Mr. Tony Andrew at $2,500 each. I will be away from home this weekend, but am not sure if I should send the cash. I would feel better by meeting them somewhere and handing it over. Then Peter Corey could send me the consignment later. YOU CAN GO ON, ON WHAT SO EVER YOU WANT BY SENDING THE MONEY OR FEELING TO MEET THEM TO HAND OVER THE CASH TO THEM, ALL I WANT, IS YOU TO RECEIVE THE CONSIGNMENT TO YOUR HOUSE THEN THE WIDOW CAN START READY TO COME OVER TO MEET YOU OK. I WILL ADVICE YOU TO SEND THE MONEY IF POSSIBLE BECAUSE OF SECURITY REASON. I PRAY TO GOD TO GIVE YOU MORE KNOWLEDGE TO TAKE CARE OF THE MONEY UNTIL THE WIDOW COME. PLEASE DONT DELAY THE PAYMENT BECAUSE IT MAY CAUSE THE RETURN OF THE CONSIGNMENT TO AFRICA. PLEASE TAKE CARE AND BE HUMBLE TO THEM SO THAT THEY CAN TAKE THING LIKELY WITH YOU. At this point we will have to skip a few emails as they were accidentally lost, but they are not integral to the correspondence. this agrrement to change then you have to pay $ 2700,.
if this can be done, then you can meet with peter corey to pay him personal, because the order will be given to him by the head office from ghana as you know, but i will advice you to send the $7500 directly to them over there then you can help the widow to receive the consignment. I know how it feels to send money to some body . but never be afriad since you have clear with this regard. I don't mind paying the total which would be $10,200. On one hand I would like to get the money the widow offers, but on the other hand I want to give my money to someone hand to hand. I am very close to concluding this deal, but could always use the $10,200 for something else. I am thinking about buying a boat. I am a little suspicious that Corey won't meet me anywhere. I wonder if he would even meet me in Houston, although I don't want to go to Houston. See if you can change the Agreement! Another missing email, basically where Mohammed is telling Ed Shanks what a terrible situation the widow is in. She needs help, and she damn well needs it now! I am a kind man. Please do not tell me of the widow's suffering as it makes me sad. I am torn between not doing the deal, going to Houston, or having the meeting with the diplomat somewhere else. Let me pray on it. I RECIEVED YOUR EMAIL TODAY AND I WLL ADVICE YOU NOW THAT I CAN NOT MAKE THE CHANGE OF THE AGREEMENT WITH OUT THE $2700 AT THE THE SECURITY COMPANY OFFICE . THE COMPANY WRITE ME A LETTER TODAY VIA MY HOSPITAL EMAIL ADDRESS TO THE WIDOW, THAT HER CONSIGNMENT WILL BE LEAVING TEXAS AFTER SOME DAYS FROM NOW TO LONDON SINE NO BENEFICIARY TO CLEAR THE FEE OF CLEARANCE, THAT TEXAS IS NOT SECURE ENOUGH FOR THE ABORDING CAGO, THAT ANY CONSIGNMENT THAT ARE IN TEXAS WILL BE CARRY TO LONDON TO THE HEAD BRANCH IN LONDON. MR. SHANKS , I AM VERY SORRY FOR THE DELAY FROM YOUR SIDE., I WILL HEAR FROM YOU IF YOU CAN SEND THE MONEY BEFORE THE CONSIGNMENT TO TO LONDON. THE SECURITY STATED IN THE LETTER TO THE WIDOW THAT IF THE CONSIGNMENT SHOULD LEAVED TO LONDON ,ANY BENEFICIARY TO CLEAR IT WILL PAY THE SUM OF $11,000 BEFORE THEY CAN GIVE OUT THE CONSIGNMENT TO HE OR SHE, BUT IT ALSO STATED THAT THERE IS NO SENDING OF LEARANCE FEE BUT HAND TO HAND PAYMENT, WHEN I READ THIS LETTER I REMMBER THAT YOU SAID YOU LIKE THAT, HENCE I WILL WANT TO KNOW IF YOU CAN TRAVELL TO LONDON TO CLEAR IT TO USA AS WELL. I WILL ADVICE YOU AS THE DOCTOR FOR YOU TO CHOSE ONE OF THE ALTARNATIVE IF YOU CAN SEND THGE MONEY , OR YOU CAN PAY FOR THE CHANGE OF THE AGREEMENT OR YOU CAN GO TO LONDON TO MEET WITH THE DIPLOMAT TO PAY TYHEM HAND TO HAND AS YOU WANT EARLIER. SHE CRIED TODAY WHEN SHE WAS THING ABOUT THE HER CONSIGNMENT. SHE REFUSE TO TAKE TREATMENT AND SOME MEDICINE I GAVE TO HER . MR SHANKS TRY TO HELP THE WIDOW OUT OF THIS PROBLEM VICTIM, IF THIS CONTINUE IT MAY CAUSE HER EARLY DEATH AS A RESULT OF HIGH BLOOD PRESSURE. I WILL TOP FROM HERE TO HEAR FOR YOUR CO OPERATION AND YOUR KINDLY RESPONSE TO HELP AS WELL. Note: At this point A. Skinner contacted me (Shiver Metimbers) to tell me that there was a possibility of baiting a scammer based in London. Of course, I was definitely up for that, and told A. Skinner to tell Mohamed that he had a partner in the UK who was only too happy to hand over $11,000 in cash! This news about the widow's health has me in a fit of discomfort. There is no way I can travel to London due to my cash flow and other various reasons. However, I have a very good friend in Glasgow, Scotland by the name of Mr. Max N. Paddy. This gentleman and I have been business partners and friends for years. I spoke with him this weekend and he would be willing to make the payment of $11,000 USD in my behalf. He will pay it in person and in cash if you will have a representative come to Glasgow to meet him there. London is only a 5 hour train journey from Glasgow. Mohamed gives us an update on the widow's health problems, and also agrees to accept payment in the UK. GAME ON! The widow was rushed down to my clinic from the refugee camp yesterday, Because she refused to eat and take her drugs i gave her, she is about to die but only GOD who save her yesterday. But now she was admitted in the clinic , i gave her some drips to give her strengt. Be advice that she is geeting better . It was so disapointed that you were unable to pay the money to the diplomat in USA. Since you have a partner in LONDON who is realiable like you, it will be better . I will be happy very well since he is ready to clear the consignment. Since you dont have chance to go to LONDON , It will be better for your partner to go and PAY THE $11,000 to the doplomat head branch office in london. give me your partner email , name and phone number so that i can contact him immediately as well. i agree with your suggestion ok. i am happy , let try all our best to help the widow ok. i want you to call me and advice the widow not to worried please, she think too much, advice her to take her drugs and try to eat ok.
when i hear from you can can call the dilomat to tell me the time the conignment will leaved for london to the head branch office of the security company as ypou know. DEAR SHANKS, THANKS FOR YOUR KINDLY CONCERNED. I WAS SO GRAETFULL WITH YOUR ASSISTANT, I HAVE CALL MR. MAX N. PADDY TODAY. I DISCUSS WITH ME VERY WELL, HE WAS SO KIND LIKE YOU,BUT HE IS NOT IN LONDON .THAT IS THE ONLY PROBLEM, HE PROMISE TO CLEAR THE CONSIGNMENT FROM THE DIPLOMAT. BUT HE TOLD ME THAT HE CAN NOT GO TO LONDON AS WELL, REMMEBER THAT YOU WERE AWARE OF THE AGREEMENT WITH THE WIDOW AND THE COMPANY. IT DOSE NOT STATED THAT THE CONSIGNMENT WILL GO TO ANY COUNTRY ACCEPT LONDON ,THE BRANCE OFFICE. TRY AND TALK TO YOUR PARTNER TO TRAVEL TO THE SECURITY COMPANT BRANCH OFFICE IN LONDON. SINCE IT IS NOT WRITTEN, IT CAN NOT BE CARRY TO ANY OTHER COUNTRY SINCE NO ONE CAN CLEAR IT FROM USA. I DONT KNOW HOW TO EXPAIN TO THE WIDOW NOT BECAUSE SHE IS UNCONCIOUS. PLEASE CONTACT YOUR FRIEND TO TRY ALL PASSIBLE BEST TO COME TO LONDON, TELL HIM THE CONDITION OF THE WIDOW AS YOU KNOW, THIS IS HER LIFE ,HELP HER, MAKE HER DREAM COME TRUE, SHE WILL COME OVER TO MEET THE SPECIALIST DOCTOR IN USA. NEVER ALLOW THE WIDOW TO DIE AND LOST HER CONSIGNMENT FOR NOT THING SAKE. I WHICH I CAN HELP I WOULD HAVE TRY, BUT NO FRIEND I HAVE IN LONDON. Well, this is a fine state of affairs. Here the widow is suffering and unconscious with her trunk boxes in London and no one to claim them. As I explained earlier, all I want to do is make sure the Security Company is paid NOW for the widow. That is what Mr. Paddy Max agreed to do for me. I did NOT expect the diplomat to deliver the trunk box. I will take care of receiving the box later through some other form of shipment to the USA. I simply want the diplomat to be paid before someone else lays claim to the box. Mr. Max Paddy has the cash ($11,000 which can be converted to British Sterling if you like), but it will be necessary for someone to meet him in Glasgow, Scotland. That is a simple task that diplomats do all the time. It would be the same thing if Mr. Max Paddy came to London to meet Mr. Michael Dannis or an associate. Please get this done as quickly as possible so we can quit wasting time. I received your email and i quit understand the basic fat. As you know the consignment is now in london, I have try all my possible best to explain to the diplomat office in london, that they should give me the last favour by still try again to take the consign to scotland, in Glasgow. That Mr. Max N .Paddy , will be the recipient this time, and he will help the Widow to pay the clearance fee ($11,000 )only. The consignment will be carried to Mr .max N. Paddy immediately you have call him for details to mandate you what day he will arried at scotland in Glasgow. Please you have to keep the secret to the deplomat because he do not know the content of the trunk box. because i dont want any diplomat to raise eye brown on you for the widow consignment ok. Call me immediately when you have hear from the diplomat traveling to scotland with the consignment as you know. It is only $11,000 you have to pay him for the clearance. immediately you received the consignment, you have to make special arrangement to ship the consignment to USA, BEFORE the widow will come over the investment to to seek for a specialist doctor for her health. fairly percentage will be given to you after the clearance has been done . May almighty Allah be with you for the consigned and all the enfort done to not allow the widow die on unconcious and not allowing her consignment get lost in london. Get back to me when you have concluded with MICHAEL DANNIS. This is excellent news for all of us, the widow especially. Please advise Mr. Dannis that a meeting on Friday or Saturday would be most convenient with Mr. Max N. Paddy. Have diplomat Dannis contact Mr. Paddy by telephone or email to work out the details. You have both his telephone and email address. Certainly the contents of the box will NOT be revealed to the diplomat. Are you all sitting comfortably? We're now going into a long session of telephone calls and very little in the way of emails! WARNING: Some of the language in the latter part of these calls is of a very adult nature. PLEASE do not listen if you are easily offended, though I hasten to add I myself behave impeccably! Shortly after mailing Ed Shanks, Mohamed gives Paddy N. Max a call to try to worm his way out of sending a diplomat to Scotland. That just isn't gonna happen Mo! Mohammed calls again to tell me the "diplomat" Michael Dannis will be calling to discuss his meeting with me in Scotland. Michael Dannis calls just a few short minutes later. What a coincidence! Michael doesn't fancy the trip though. Later that same afternoon Michael calls again. Looks like the meeting may be on. Michael passes me onto his partner Ken Wilson. After a 5 hour trip, Ken has arrived at Glasgow airport! A little bit of research gives me the names of various cafe's that are in the Glasgow airport terminal. My plan is to get him to a cafe and then call eh cafe itself to confirm Ken IS actually there! I decide to give Ken a call to ease his mind a little, and let him know I'll be there soon. Ken found a cafe called "Deli De France" which I confirmed was an actual cafe in the airport. Ken wasn't quite as abusive as I'd hoped for, but don't worry readers, it gets worse! Ken's partner calls to ask for an explanation. This is where the bad language starts folks! Just when I was recovering from the disappointment of the rather lame threats, a great call comes in late in the evening. Apologies for my rather juvenile behaviour, I was just trying to wind these guys up! NOW we're getting somewhere. Pity that they didn't give me much of a chance to taunt them some more! Shortly after the above call I release this scammer's telephone number to all the members on the 419eater forum. It appears they got a LOT of calls and the phone is now dead! Ed Shanks send a message to Dr. Mohamed to try to explain what the hell is going on! I just got the word from Mr. Max N. Paddy that he thought you were a crook and scammed you. I had no idea that he thought something like that and would trick your diplomat into coming to Glasgow Scotland, then not show up himself. Max N. Paddy thought this would protect me from getting cheated, but I wanted to transfer the boxes for the widow. I believe you and he didn't. He said you were very upset. I still want to transfer the box. However, if you don't trust me anymore that is fine also. Dr. Mohamed, suitably unimpressed with the day's proceedings decides to contact Ed Shanks for an explanation! I RECEIVED YOUR EMAIL AND MR.MAX N.PADDY TODAY IN MY OFFICE. BUT I WAS SURPRISED, I DONT UNDERSTAND ANY MORE, WHAT IS WRONG, I BELIVED YOU ALL DAY LONG. PLEASE CAN I HEAR MORE BETTER FROM YOU HOW THE DIPLOMAT DEAL WITH YOUR FRIEND IN SCOTLAND.?????. I AM NOT SO SURE OF WHAT YOUR FRIEND TOLD ME ALL ABOUT., IF THAT IS THE CASE , I WILL ADVICE YOU THAT YOU AND YOUR FRIEND TO COME TO GHANA TO MY CLINIC AND SEE WITH YOUR EYES . IT WILL BE BETTER FOR ME TO RETURN THE CONSIGNMENT FROM SCOTLAND OR LONDON TO GHANA. SO THAT YOU CAN COME AND CARRY THE WIDOW TO YOUR COUNTRY WITH THE CONSIGNMENT AS WELL. I AM NEVER A CROOK OK ,I AM A GOOD ISLAMIC MAN WHO HAVE THE FEAR OF ALLAH. IF THE DIPLOMAT DISAPOINTED ,LET GIVE THE GLORY TO ALLAH, ALL I KNOW THE CONSIGNMENT MUST BE GIVEN TO YOU. WHAT PAINS ME ALOT IS THE NAME YOUR FRIEND TRY TO CALL ME. I DONT KNOW IF HE HAS FORGOTTEN THAT I AM NOT THE DEPOSITOR OF THE CONSIGNMENT, I AM ONLY DOING A FAVOUR FOR MY CLIENT / PATIENT AS YOU KNOW . AS YOUR FRIENT IS A DIRECTOR TO A COMPANY ,THAT IS HOW I AM STILL SOLE PROPRIETOR / DOCTOR TO MY HOSPITAL. I WONDER WHY HE SHOULD ADRESS ME LIKE I AM A CHILD. OH OH MY GOD. NEVER WORRIED SHANK EVERY THING WILL BE IN CONTROL OK.I CAN NOT BECAUSE OF MONEY POLUTE MY RELATIONSHIP WITH YOU AND MR MAX N.PADDY, OK. THE MATTER IS THAT LET US REASON TOGETHER. I WILL WANT YOU TO COME TO GHANA AND MEET ME AT MY HOSPITAL WITH YOUR FRIEND MAX N. PADDY. SINCE I HAVE CONTACTED YOU TO HELP THE WIDOW ,I KNOW IT SHALL COME TO PASS . I WAIT FOR YOUR URGENT REPLY AS A MATTER OF URGENTCY. my hospital then they can see her, that makes her stop cring today. she said you should come that she want to see you. please shanks and co. dont feel tied about the business, i pray to God that you will received the consignment here in ghana very safty as well. awaiting to hear from you. I have been in touch with Mr. Paddy Max and have scolded him severely for making fun of you and causing all that trouble. Needless to say he will not travel to Ghana or anywhere else to meet you. For all the trouble he has caused you in my name, now I am fearful of meeting you also. You may still be mad. He mentioned that you have the Nigerian Mafia after him. Mr. Paddy is quite crazy and will do some weird things. I should never have trusted him. However, perhaps you and I and the widow can still do business. I am considering sending you the cash required by Western Union. Mr. Paddy advises against it, but for some reason I find you a trustful person. I could send you part of the money, then the rest later. We would have to have some sort of agreement. What do you think? I AM IN RECIPIENT OF YOUR EMAIL TODAY IN MY OFFICE. YOUR PARTNER MR. PADDY N. MAX, I SUGGESTED THAT HE IS NOT HAPPY OVER THE BUSINESS BECAUSE THE WIDOW SAID THAT SHE DONT WANT HER CONSIGNMENT TO BE INVESTED IN UK .BUT IN USA. I THINK THAT IS THE REASON WHY MR. PADDY WAS DOING THAT. HENCE I WANT YOU AND HIM TO COME TO MY CLINIC TO SEE THE WIDOW. I HAVE NO NIGERIA MAFIA PLEASE , I AM A GENTLE MAN WHO ONLY HAVE GENTLE MEN FRIEND AS I AM. ACCORDING TO THE AGREEMENT , I WILL CONSULT MY LAWYER FOR THE LETTER OF TRUST ON MONDAY OK. BUT YOU HAVE TO KNOW THAT MR PADDY WANT TO POLUTE OUR RELITIONSHIP ,I AM READY TO FINISHED THE BUSINESS WITH YOU OK.
YOU HAVE TO TELL ME HOW MUCH YOU HAVE NOW TO SEND SO THAT THE ATTONEY CAN PREPARE IT VERY WELL. I AM HAPPY FOR THIS IDEA BECAUSE I WANT EVERY THING I WANT TO DO NOW MUST BE LEGAL AND LEGITIMATE AS WELL BECAUSE MR PADDY HAS DISAPOINTED ME.. I HAVE FORGIVEN HIM OK ,AFTER YOU HAVE SEND THE MONEY THEN I CAN PAID THE DIPLOMAT HEAD OFFICE HERE TO DELIVERD THE CONSIGNMENT TO YOU IN USA AS IT WAS DONE IN SCOTLAND. DONT BE TIRED, EVERY THING IS IN CONTROL, MR. PADDY IS NOT A RIGHT PERSON BECAUSE HE REFUSE TO GIVED ME IS PASSPORT OR ID CARD, I DONT KNOW IF HE WANT TO RUN AWAY WITH THE WIDOW MONEY /CONSIGNMENT... PLEASE STATE THE MONEY FOR THE WESTERN UNION SO THAT EVERY THING CAN BE DONE WELL. BUT BE ADVICE THAT THE TOTAL MONEY FOR THE CLEARING IS $11,000 . PLEASE MR SHANKS TRY FOR THE WIDOW LIFE NOT TO DIE WITH HEART ATTACT, NOT THE MONEY IS THE MOST PRECIOUS BUT HER LIFE, SHE IS CRING TO MEET YOU THEN YOU CAN TAKE HER TO THE SPECIALIST DOCTOR IN USA. I WAIT TO HEAR FROM YOU URGENTLY . I was certainly glad to receive your mail. During our conversations you always came across as a kind and gentle man. Let me explain the situation to you. Some years ago Mr. Paddy was scammed out of several thousand dollars and thought you were trying to scam me. We have had a long talk and I have convinced him that you are a truthful and honest man who just has the widows welfare at heart. Therefore, we will both be available to fly to Ghana to meet the widow and your kind self, and hand over the $11,000 USD. There is only one hitch to us coming to Ghana. Mr. Paddy Max insists that the person who gave him the death threats must call him and apologize. He must apologize and promise not to kill either of us. Let me know what you think of this idea ASAP, so we can make our travel arrangements. Managing Director: Dark Side Communications Inc. Thanks ever so much for your email. You have certainly put my mind at ease. I am sorry that I reacted in such a way to Mr. Mohamed and his partners, but as you know, I have in the past lost over $29,500 dollars to a scammer in the Netherlands. This hurt me very much and I have been suspicious of such business deals ever since. However, your long talk today has convinced me that I was wrong about Dr. Mohamed. Maybe I was too quick to judge this man. From what you have told me he seems like a very humble man, so I WILL help you by giving you the $11,000. You stated that Dr. Mohamed wants the payment by Western Union? If this will make the deal faster for you Ed I will be happy to make the who payment this way, however, I must insist that Dr. Mohamed speaks to me in person over the phone to apologise for his actions against me. This is the only condition that I have. Once I have heard Dr. Mohamed's apology with my own ears I will then make the transfer for you. Dr. Mohamed will need to tell me to whom I am to make the payment to. Once I have made the payment I will fax/email him with the payment receipt. If Dr. Mohamed still requires a copy of my passport I will be happy to send it to him. Thank you again for our long talk today Ed, it was nice to speak with you again. Short and to the point, but it's one-up for the good guys! thanks for your co operation during our brif conversation on the phone today. I am very happy to get you on the phone today, i have been calling all day but no one picks the call. But mr. ED told me that it wes your office line. may be you are not on site by then, so sorry. I will give you the name right away to send the money toay as you know, there is no time to be wasted from you, immediately you have send the money to day ,i will rushed over to the head office and pay the money immediately ok, then you can tell me where i will order the diplomat to do the delivery as you know. for a relaxation. She pray for you and ED SHANKS, SHE SAID SHE WILL BE WITH ED VERY SOON, BECAUSE SHE NOW KNOWS RIGHT NOW THAT EVERY THING HAVE BEEN IN CONTROL. SHE is a good christain , God has answered her prayer all day. TH NAME TO SEND THE MONEY IS GODSTIME AGOBA . PLEASE IMMEDIATELY YOU HAVE DO THE SEND, YOU HAVE TO CALL MY ATTENTION ON THE PHONE AND GIVE ME ALL THE SENDING DETAILS AND YOUR PASSPORT. I WILL STOP HERE TO WAIT FOR YOU OK AS SOON AS POSSIBLE. immediately so that the company can delivered the consignment to you in your house in america . I understand your words of travelling , i wiches you safe jonney. i will advice you to always have a contact with MAX N.PADDY ALWAYS to be updateing you alday,Please i will advice now to please wait for the diplomat at your house ,because immediately the money is paid today, you are going to recieved the consignment this week. Please i am begging you to do me the favour by checking your email untill you are back ok. I will stop here to hear from paddy Max N. inregard of the sending of the fund today. The payment has now been made and you should be able to collect the money immediately. The control number is 8173911753. As you requested I have also attached a copy of my passport. Unfortunately my scanner was not working correctly to send you a scan of the Western Union receipt but I was able to take a good quality photograph of it for you so that you can view the details. 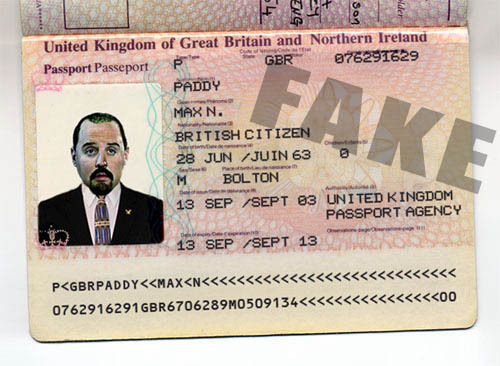 I attach a copy of Max N. Paddy's passport (UK readers will recognise the photo as that of Peter Kay!). Note that I have marked FAKE on this passport so that scammers don't try to use it on real victims. Above is a copy of the Western Union payment I sent to Mohammed. Note the American Express Corporate Platinum card added for extra effect, and the Rolls Royce car keys! I think the fake Western Union payment pushed Mohammed over the edge. It has been many weeks now and he never got back to either Max N. Paddy or Ed Shanks. Looks like this particular case is over!